Paul Escobar is avoiding the trend of common rapper by expressing his unique lifestyle and grind through his music, inaugurating his lyrics in the Hip Hop Industry! This 22 year old kid was born December 7, 1995 raised by his mother in North Miami, Fl. However, life has not always been sweet. Growing up, Paul was not as fortunate as his peers, and did not do very well in school. His only focus and aspiration was to be a Hip Hop artist, however, his parents could not afford any studio time or any other extracurricular activities for that matter making it a very frustrating situation for this motivated future hip hop sensation. At the age of 13, Paul began breaking into houses and cars to earn income for studio, which only fueled his motivation. If Paul wasn’t breaking into houses, he was in the studio, and vice versa, ultimately, this routined lifestyle led to trouble and arrest. By the age of 16, Paul dropped out of school, and the game of armed robbery, to set his focus solely on his music! In early 2016, a new elevated hustler, Paul Escobar, began creating a new Hip Hop trend in his city. He dropped his first mixtape ‘King of Miami’ produced by Zaytoven which featured artist like Kodak Black, and Young Dolph. This mixtape expresses a new level lifestyle, that the HipHop music world is rapidly absorbing. “I won't stop until I’m on top! I've been through it all, so I can't wait to see what's in store for me” Says Paul Escobar. 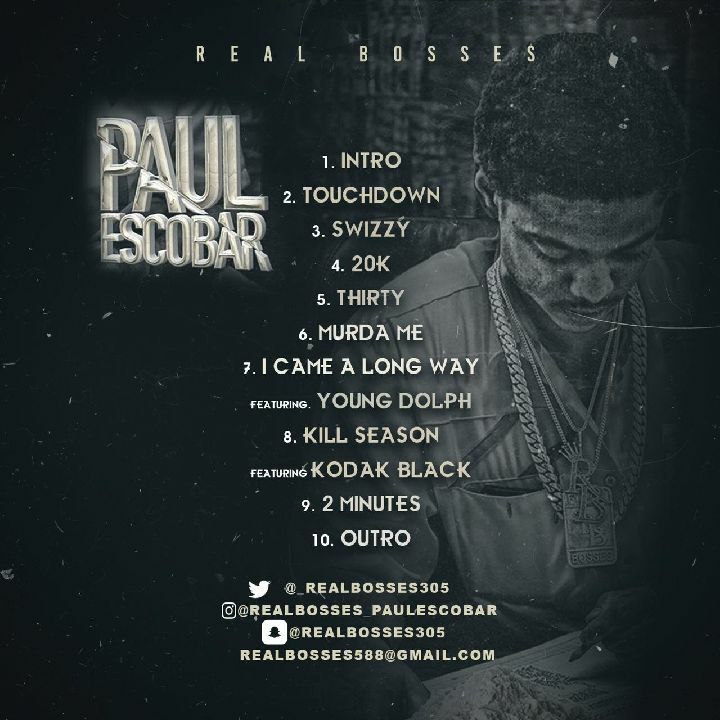 Paul Escobar is undoubtedly the next young rapper coming out of South Florida. His fidelity to his craft and grind clearly shows that he has what it takes to be accomplished, and South Florida seems to be backing and relating to him 100%.